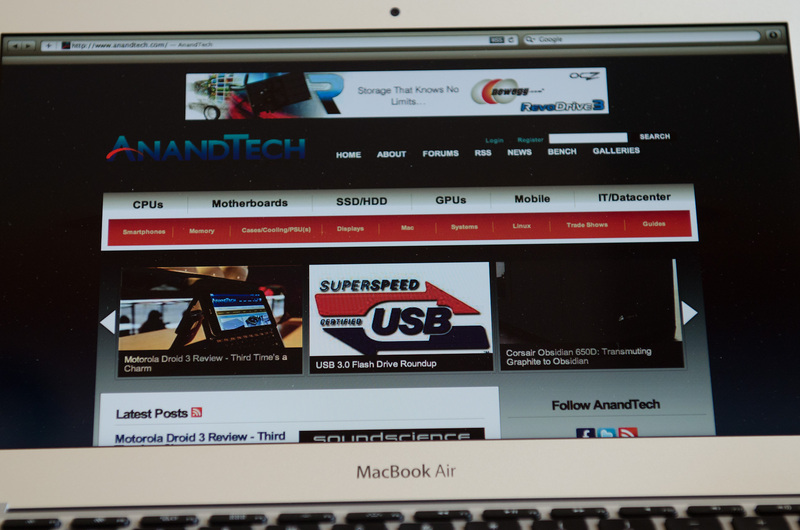 Last week we published our review of the new 2011 MacBook Air. 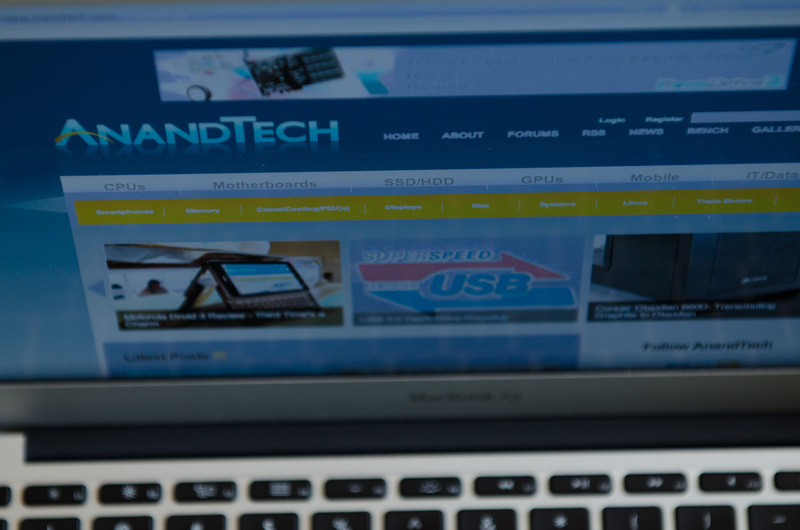 Both the 11 and 13-inch models ship with ultra low-voltage (ULV) dual-core Sandy Bridge CPUs, a first for the lineup. Also another first for the lineup is the fact that you can now get equally specced CPUs in both models. In theory you'd be able to have the same performance regardless of chassis size. 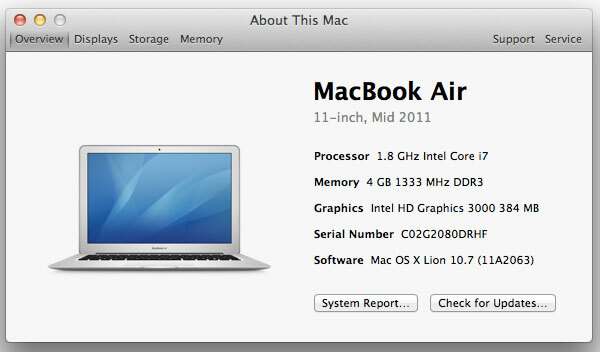 The 1.8GHz Core i7 is offered as an upgrade to both the 11 and 13-inch MacBook Air. 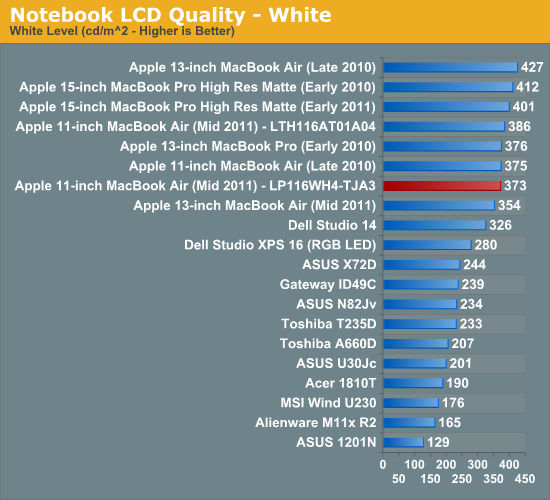 With much higher max turbo speeds and another megabyte of L3 cache, it's clear this is going to be a big upgrade over the standard 11-inch Air. Last week we got our hands on one of these upgraded 11-inch models to find out just how much faster it is. 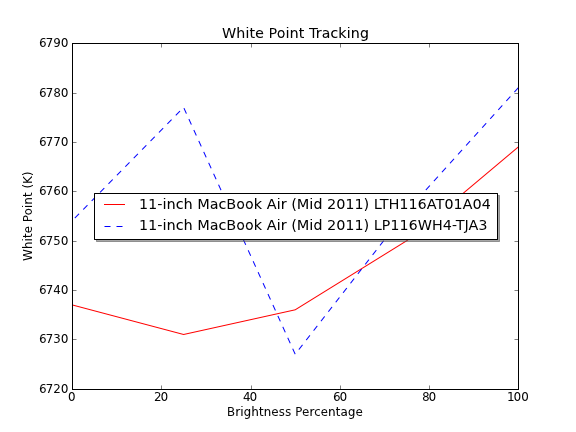 We also wanted to find out what sort of an impact the faster CPU would have on the 11's thermals and battery life. It just so happens that our upgraded 11 gave us more than just that to investigate. 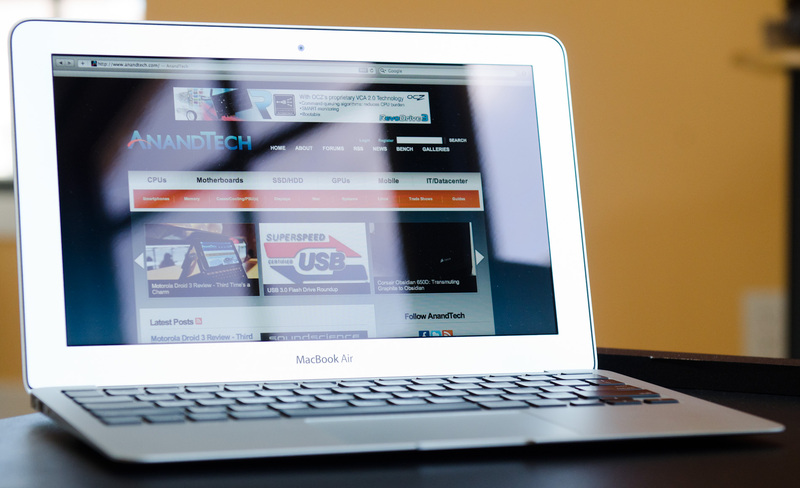 For commodity parts within its systems Apple typically sources from two different vendors. This is done to avoid shortages due to a single component vendor. It also puts Apple in a good negotiating position. 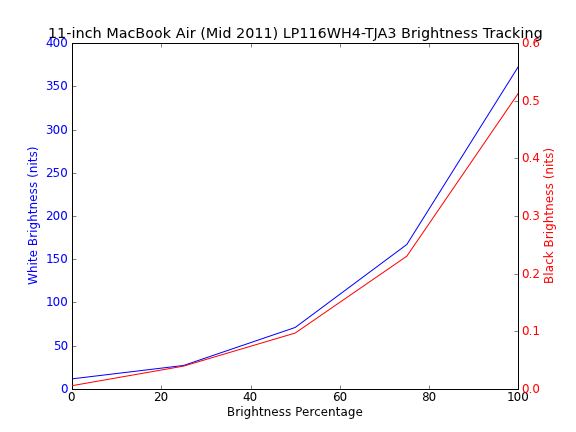 The MacBook Air is no different. Each model (11 & 13-inch) ships with one of two panels. Word on the street is that one of those panels is better than the other. It was time to find out if that's the case. The LG panel is slightly dimmer than the Samsung panel I originally tested. In normal usage I never noticed the increase in contrast, nor did I feel the panel was any dimmer, but there is technically an advantage here. Color accuracy is also slightly better on the LG panel, although this small of a difference is basically impossible to notice. 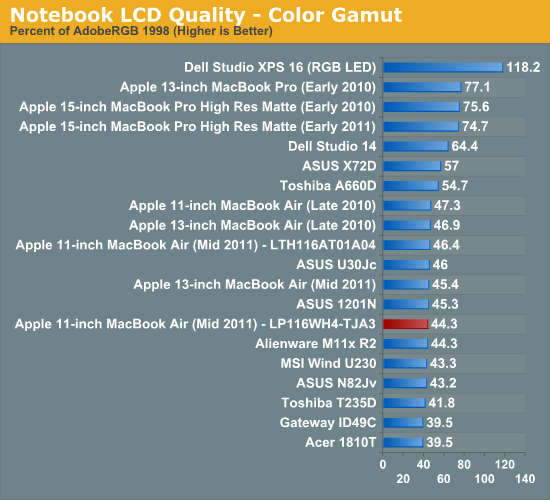 Perhaps due to backlight differences the LG panel does have a narrower color gamut. 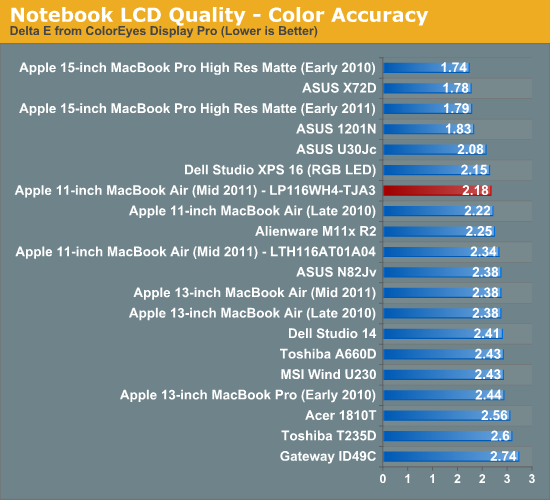 Based on these numbers alone I don't see any reason to believe that the LG panel in the new MacBook Air is any worse than the Samsung panel. 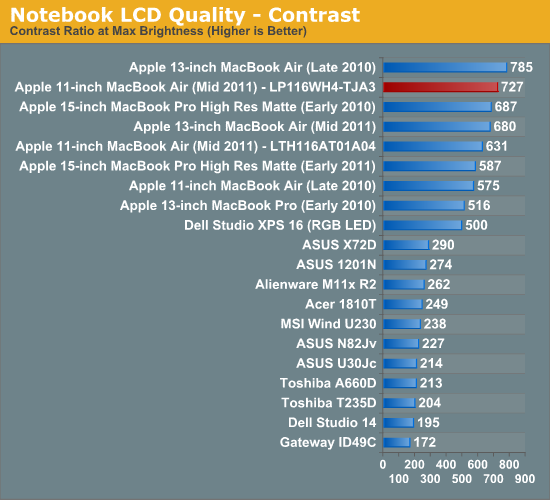 However I do believe that there may be an explanation for the perceived inferior quality of the LG panel. 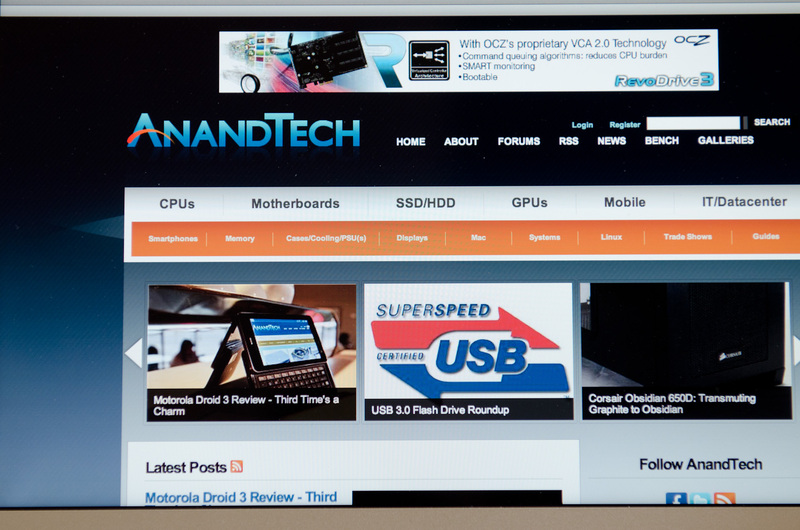 The LG panel exhibits vertical color/contrast shift more readily than the Samsung panel. Unfortunately I don't have them both here to show you a side by side comparison but the LG panel seems to be slightly more sensitive to vertical viewing angle. 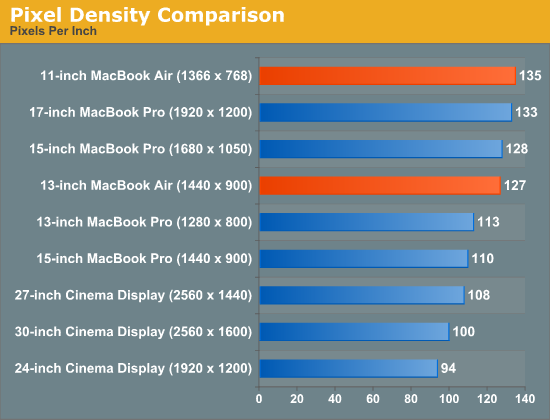 As I mentioned in our original 2011 MacBook Air review, the 11 is a particularly tough system to use due to the height of its display. In order to get perpendicular line of sight to the display you need to tilt the display back and your head down. If you're off by just a few degrees you'll start to see color/contrast shift. On the LG panel that classic TN panel distortion seems to come a bit sooner than on the Samsung panel. The issue was most noticeable to me when I had the 11 on a desk rather than on my lap. While it was particularly bothersome when I first got it, I've since become used to the display. Obviously these machines are expensive enough that I believe you should be happy with your purchase, but from my perspective the two panels are close enough that it's not worth losing sleep over. Both the LG and Samsung panels are TN panels. They may have better display characteristics than your typical cheap TN panel, but they still have the same viewing angle limitations as other TN panels. Both panels exhibit the same issues, the LG may just show them off a few degrees sooner. 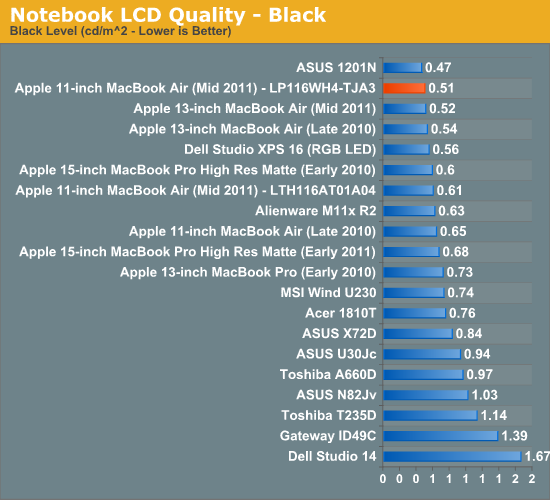 While I'm glad Apple opted for a high resolution 11-inch display, not everyone will find it easy to read. This isn't something that varies with panel type, it's just a side effect of having a small display with a high pixel density.